According to a new market report published by Transparency Market Research titled ‘Residential Robotic Vacuum Cleaner Market (Product Type: In-House Robot, Outdoor Robot; Charging Type: Manual Charging, Battery Charging; Operation Mode: Self Drive, Remote Control; Distribution Channel: Online, Offline) – Global Industry Analysis, Size, Share, Growth, Trends, and Forecast, 2018–2026,’ the global residential robotic vacuum cleaner market is expected to reach US$ 4,112.1 Mn by 2026, expanding at a CAGR of 9.2% from 2018 to 2026. Europe held a significant share in the residential robotic vacuum cleaner market in 2017. The global residential robotic vacuum cleaner market is expected to be driven by factors such as increasing expenditure on household appliances and increasing awareness about indoor health and hygiene. However, the global residential robotic vacuum cleaner market is expected to be challenged by the availability of substitutes in the market. Investment in research and development to make the vacuum cleaners more efficient in suction power and long operation time is likely to offer attractive opportunities to the market. Efficiency, running time, and room coverage is trending in the global residential robotic vacuum cleaner market. In terms of product type, the in-house robot segment constitutes a dominant share of the global residential robotic vacuum cleaner market. This is because in-house robotic vacuum cleaners are affordable compared to outdoor robotic vacuum cleaners and the prevalence of single households has helped the segment to witness higher growth. In terms of charging type, the battery charging segment constitutes a share of over 55% of the global residential robotic vacuum cleaner market. This is because consumers find it easy to operate a battery charging robot as it can automatically reach the charging station. In terms of operation mode, remote control dominates the segment due to its cheap cost and extensive availability in the market. In terms of distribution channel, offline channel dominates the market since consumers want to physically understand the product. The robotic vacuum cleaner is only a decade old and consumers desire to inspect the product before buying it. Various companies have innovated with the product to ensure a strong presence in the market. This in turn is expected to boost the growth of the residential robotic vacuum cleaner market. In terms of region, Europe accounts for dominant share of the residential robotic vacuum cleaner market. Europe accounts for more than 29% share of the global market. It is expected to continue to dominate the market during the forecast period due to its large consumer base of working people. The market in the United Kingdom is likely to expand at a rapid pace. The U.K. constitutes a prominent share of the residential robotic vacuum cleaner market in Europe. A high working population drives the market in the country. The market in the U.K. is expected to expand at a rapid pace as the market in Germany is relatively saturated. Germany is expected to account for 1/4th of the residential robotic vacuum cleaner market in Europe during the forecast period. The market in European countries is also driven by the increasing single household. China is a dominant country in the residential robotic vacuum cleaner market in Asia Pacific. Chinese companies manufacturing robotic vacuum cleaners quote a lower price compared to other companies in the market. The market in China is mainly driven by the availability of low-cost robotic vacuum cleaners. China is followed by Japan and India in the region. The market in India is expected to expand at a rapid growth rate during the forecast period, due to change in lifestyle of consumers and increasing disposable income in the country. GCC is a leading sub-region of the residential robotic vacuum cleaner market in Middle East & Africa. It is estimated to dominate the market during the forecast period. The market in South Africa is expected to be driven by a favorable political environment, which is enabling the setting up of more factories and resulting in higher sales of robotic vacuum cleaners. Brazil accounts for more than60% of the residential robotic vacuum cleaner market in South America and is expected to continue to dominate the market in the next few years. The market in Brazil is likely to be driven by acceptance of technological products by the population. The Rest of South America constitutes a minimal share of the market. The market in the sub-region is expected to expand at a sluggish pace in the coming years. 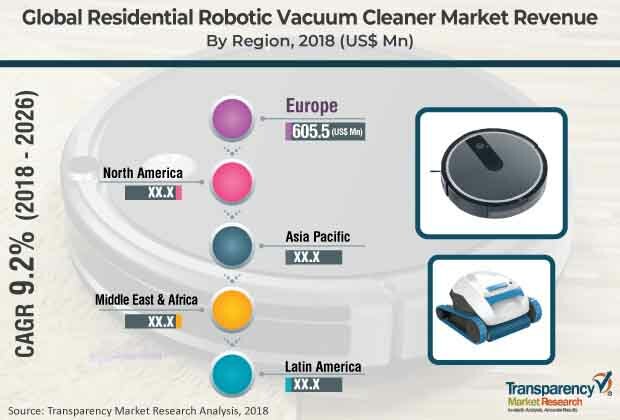 The residential robotic vacuum cleaner market is characterized by the presence of a number of local and regional players and intense competition among them. Some of the industry participants in the residential robotic vacuum cleaner market are Bissel Inc., Dyson Ltd., Electrolux AB, Haier Group Corporation, iRobot Corporation, Koninklijke Philips N.V., LG Electronics Inc., Miele & Cie. KG., Panasonic Corporation, Robert Bosch GmbH, Samsung Electronics, Black Decker Inc., Shark Ninja Operating LLC, Ecovacs Robotics Ltd., Cecotec Innovaciones Sl, and Neato Robotics, Inc.